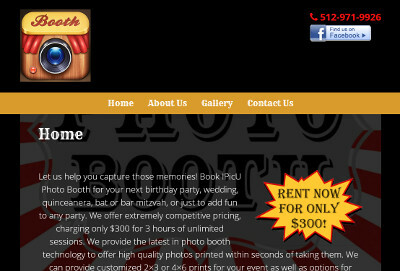 Terry, the owner of IPicU Photo Booth, reached out to us yesterday asking about pricing for our website design services. We supplied a break-down of costs based on what he requested and he was ready to get started on the website right away! We received all of the info that Terry wanted to put on the site throughout today and put the website together. Just about 24 hours after the order was placed, the website was completed and approved! IPicU Photo Booth’s website is at ipicupb.com.